At this year's (2014) Indianapolis Hamfest at the Marion County Fairgrounds, the IRCC held a forum to present the winner of the Indiana Technical Excellence Award. 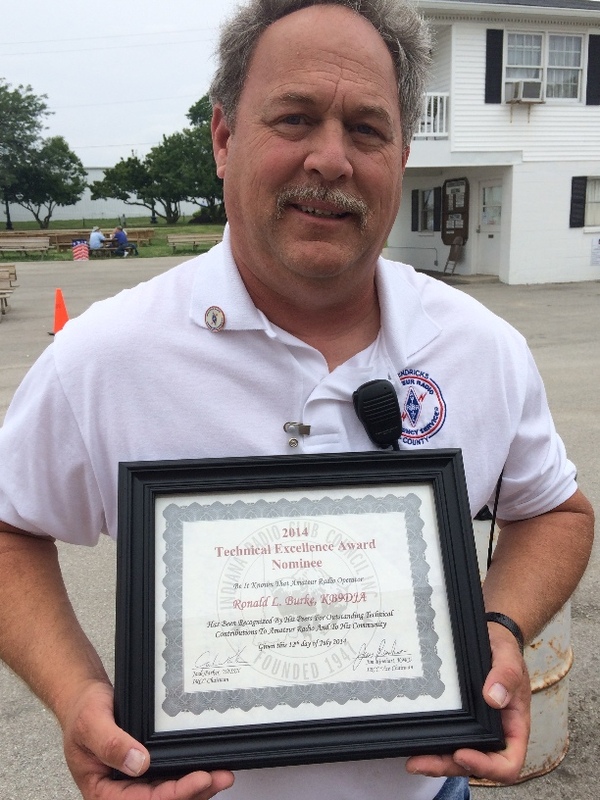 Hendricks County EC Ron Burke, KB9DJA, was nominated for the above award by Wayne Michael. However, Mr. Burke was not the winner of this year's award. Wayne Michael, AC9HP, nominated Ron for being the architect of helping both Hendricks Regional Health and I.U. Health West hospitals with planning and programming the Amateur radio's that will be used in case normal communications are lost during an emergency. Each Amateur radio station is located inside the hospitals' Emergency Command room. Not only did Ron work with both of these hospital's administration to obtain the Amateur radio stations, but also helped in getting volunteer hams training on how to work in the Emergency Command room during an emergency/disaster. Each hospital has ten hams that have had this training and have hospital credentials that will allow them in the hospital when called upon. Each month a "hospital ham" will run the Hospital Net from each hospital's radio station. This type of interaction between hams and the hospitals will build a relationship for each entity to know one another which is crucial during emergencies. Bill Gouge, AA9EG, in conjunction with Ron Burke, designed a digital communications network which will be implemented at each hospital in the near future. The digital network will allow hospitals to communicate with their satellite locations via keyboard, instead of voice. Together, these backup communication systems will allow the hospital staff to have the information they need if a disaster strikes. Weak signals can get into the repeater better when transmitting a 123.0 Hz tone. However, a tone is NOT required. Hospital Radio Net the 3rd Thursday each month on 147.570 MHz simplex at 9:30am. All Hams are invited to participate.